The multi-blog TBR Challenge tends to end with holiday romances in December(or at least it has during all the years we’ve participated), and those tend to be fun comfort reads for us. Both of us tend toward historical holiday reads, and this year is no different. Caz picked a European historical, while Lynn went with a Western anthology. 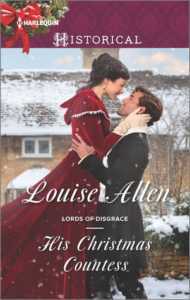 His Christmas Countess is book two in Louise Allen’s most recent series, The Four Disgraces, in which the heroes are a group of young men who earned that sobriquet as a result of their daring exploits at school and university. For some reason, I read the first, third and fourth books when they came out and missed this one – which was a mistake, because while I enjoyed the others and rated them highly, this is the best of the lot. It’s Christmas Eve and Grantham Rivers is on his way from Edinburgh to Northumberland, where he hopes to get to the bedside of his dying grandfather in time to say his final goodbyes. When his horse goes lame, and with the weather worsening at every moment, he has little alternative but to take refuge in a shepherd’s hut or “bothy” – and is astonished to discover that he is not the only one stranded in the middle of nowhere while waiting for the storm to pass. A heavily pregnant woman is sheltering there, too, and Grant who, while not a doctor, has studied medicine – recognises the signs of early labour. Kate Harding was all but pushed into the arms of the man who ruined her by her unscrupulous brother, who now intends to blackmail her child’s father. Threatening to take Kate’s baby from her in order to ensure her co-operation, her brother sent her to Scotland until the birth, but when – at last – the chance to escape arose, Kate took it, and made her way to the nearest coaching inn. But her money was stolen, leaving her penniless; the weather is closing in and she is alone, friendless and scared, with no alternative but to wait out the coming snowstorm in a nearby bothy. But it seems someone else has had the same idea. The man who enters is tall, dark, handsome and somewhat severe, but he quickly reassures her, telling her he is a doctor and that he will make sure she is safely delivered. Grant, a widower, has a young son by from his first – disastrous – marriage, and is well aware that six year old Charlie needs a mother. He is also heir to an earldom – something he neglects to tell Kate, understandably in the circumstances – and has been feeling guilty about the fact that he has neglected to do the one thing his grandfather had asked of him, and marry again. Impulsively, and as Kate nears the end of her long labour, he suggests that they marry – he needs a mother for his son, her child will need a father – and as they are in Scotland, all they need do is declare their intent to wed before witnesses. A couple of passing shepherds are pleased to perform that service, and Grant and Kate are married, shortly before her daughter, Anna, makes her way into the world. Given the remoteness of Grant’s home, and the fact that as a medical man, he is unlikely to move in the same circles as her brother, Kate believes she has found the perfect refuge. So when they arrive at Abbeywell Grange and she hears Grant addressed as “my Lord”, she is shocked. Grant tiredly explains that his grandfather – who just passed away – was the third Earl of Allundale, and that he (Grant) is now the fourth earl, and Kate is immediately worried. An earl will be expected to spend some of his time in London and Kate has no wish to return to the scene of her disgrace or to risk an encounter with her brother. But what’s done is done, and she recognises she is in no fit state to think about much more than caring for her daughter and taking comfort in the warmth and safety of her new home. Shortly after his grandfather’s funeral, Grant tells Kate that he must go to London to consult with his solicitor and to see to various other matters of business. He ends up being away for almost six months, and finally returns home to find things much changed. The wife he had left a tired, pale shadow is now a pretty, vibrant young woman with a quick wit and keen intelligence; and Grant is not a little surprised at the strength of the attraction he feels towards her. Grant’s first marriage was a passionate love match – or so he’d thought, until his beautiful wife began to show signs of mental instability that turned into hatred. He is still haunted by the manner of her death and clams up every time Kate tries to get him to tell her what happened. But Kate is persistent. She never bullies or demands and eventually Grant realises that she deserves the truth. The one black mark I can make against Kate is that while Grant shares the truth of his past with her, she does not do the same, causing him to continue to believe that she is still carrying a torch for Anna’s father. Kate knows she needs to come clean, but, not wanting to jeopardise their marriage, makes some poor decisions and tries to deal with her brother herself. But those are my only criticisms of what is an otherwise excellent book. As the story takes place over a year – we get two Christmases for the price of one! – the romance is allowed time to develop and we watch Kate and Grant progressing from physical attraction to a deeper emotional connection. 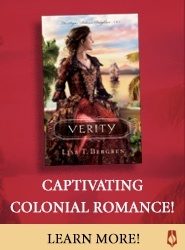 The love scenes are sensual and romantic; nicely steamy but not over the top for this type of story, and written with an extremely sure hand. Louise Allen has crafted a wonderful story about two strangers thrown together by circumstance who progress from mutual friendship and respect to passionate attachment. They have to get to know each other and both of them make mistakes and say and do things that annoy the other, yet they are both mature enough to be able to own up to those missteps, apologise for them and move on. Even though both are keeping secrets, there’s an honesty to their relationship that is refreshing, and a sense that these are two people who are going to make a go of things, no matter how shaky the start to their life together. All in all, His Christmas Countess is a superbly written, beautifully paced romance and it’s going right onto my keeper shelf. I’m usually not an anthology junkie, but when Christmas rolls around, I just can’t get enough Christmas stories. As a result, I have quite a stash of holiday anthologies. 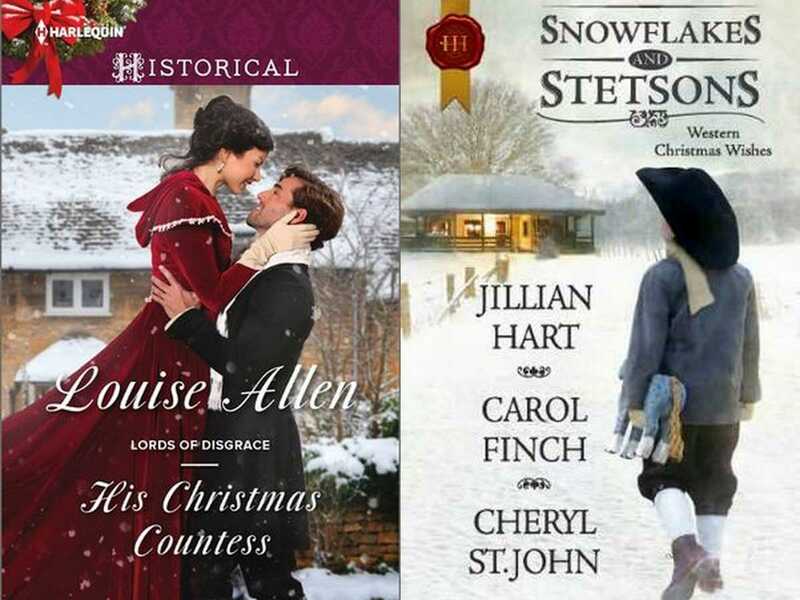 For this month’s TBR, I pulled out the 2011 Snowflakes and Stetsons collection from Harlequin. While there wasn’t any one story that hit it out of the park, I more or less liked everything I read here so I’ll definitely count this book as one for the win column. Do you like your holiday tales with a heavy helping of angst? 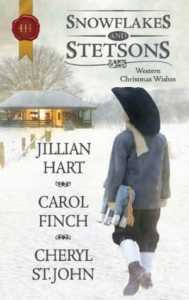 The Cowboy’s Christmas Miracle by Jillian Hart delivers more than a little bit in that department, and frankly, Hart writes a good emotional, “tug at the heartstrings” sort of story. In this tale, Caleb McGraw has just finished serving his sentence for a crime of which he was wrongfully(of course) convicted and he is passing through his old Montana town to see the former sweetheart he left behind. The next story, Christmas at Cahill Crossing by Carol Finch, takes us to 1880s Texas, and switches things into a more humorous tone. The heroine, Rosalie Greer, has opened a dress shop in the small town of Cahill Crossing. How a small frontier town can support a fancy dress shop is pretty much beyond me, but there you go. What’s important is that Miss Greer got caught in a blizzard while taking supplies back to town. Fortunately, she is saved from death when Lucas Burnett’s dog finds her in a snowdrift. Readers go a little further back in time with Cheryl St. John’s story, A Magical Gift at Christmas, which takes place several months after the end of the Civil War, on a train headed to Denver with a supply of gold. Beset by bandits, the last few cars of the train are uncoupled in an attempt to keep robbers from the car containing the gold. This strategy also leaves a private car, with the owner’s socialite daughter as passenger, stranded in the snow. It’s not often that I come across an anthology where I like all of the stories, but that was certainly the case with this strong collection. I’m so glad my TBR pile turned up a winner. What a pretty cover for His Christmas Countess. Thanks for mentioning the two Christmases in this one, Caz — that alone would intrigue me. How fun that we chose the same book for our challenge this month, Lynn. I realize more and more each month how much our reading tastes are similar. I still have one more story to read in it, but I’m glad I chose it as well, especially for Cheryl St. John’s story. I saw on Goodreads that we had picked the same book, so I ‘ve been following your updates to see what you thought of it, too. And yes, I do think we have somewhat similar reading tastes. I hope you’re doing TBR Challenge next year, too! So it’s nice to see I’m not the only one who reads romance series out of order. I can’t tell you how many times I’ve read books 1 and 3 and then have had to backtrack to pick up book 2. When I read this, I wondered if you’d read it. If not, I was going to recommend it to you since I know you love a good Western.